1.) Hey there Bruce, let's start right at the beginning with your roots in Rome. How old were you when you moved to Delaware? Did aspects of Rome inspire you as a child and lead to a chosen path in art? I was born in Rome because my Dad won the Rome Prize and was becoming an archeologist. We moved back to America when I was 1 1/2 years old, so I don’t remember much, but growing up in a small town definitely had an affect on my path as an artist, because we had a lot to be inspired by as a kid. For instance, they used to have a jet fighter in our playground and you could climb all over it. 2.) What was your earliest experience with making art? I remember making a papier-mâché landscape with my mom. It had mountains and a road and a little lake. It was for my matchbox cars. 3.) Was there any major deciding factor or moment in realizing you would dedicate your life to art? I can’t zero it down to one moment. Since I was a kid it was what I loved the most and what I just did on my own. There have been lots of moments in my life where a door of possibility opened, like when I worked for a student newspaper in high school or the first time I saw a zine, or when I went to the Puppet Uprising puppet show in Philadelphia. Seeing someone just make something and put it out there with no expectations and no obligations to anyone reaffirmed the DIY ethic that has always been most inspiring to me. Seeing my first zine showed me you didn’t need a publisher. Seeing Puppet Uprising showed me the possibilities of puppetry, that it doesn’t have to be fancy materials and you don’t necessarily have to have a theater background to do this. I remember a show where the puppets were made out of crutches, and thinking “what a great idea!” and “how beautiful!” and then “I want to do this, too!” As far as dedicating my life to art, I don’t have a choice. 4.) We’re excited to have you as our first featured puppeteer. How did you first discover puppeteering? Any favorite personal puppet creation or creation? I first discovered puppeteering by making puppets out of construction paper and doing shows from behind the sofa. My favorite puppet I have made is Cora Gated and androgynous doll like puppet made out of cardboard, papier-mâché and bike tubes. I hope that none of the other puppets read this. If they get jealous I’m in trouble. 5.) I’ve seen plenty of creator’s studios, but never that of a puppeteer. I’m envisioning all manner of half-made/made/retired puppets hanging from the ceiling, peaking out behind boxes, hiding out on shelves, all with a story to tell. If the inhabitants of your studio could speak, what would they say? 6.) You work with a lot of recycled materials how did you come to work with such an unpredictable and always changing medium? Do you have a favorite material to work with? There're lots of reasons I love that stuff. I don’t have to buy it. I can find it anywhere. Boxes and broken toys and tin cans come with a story, and that’s interesting. I love that stuff. I really love cardboard. I like toilet paper rolls. I also like the idea that I am saving something from the trash like this thing gets a new life. 7.) Bruce, a big part of what you do as an artist is actually Art Therapy through the RAW Arts program based in Lynn, MA. RAW welcomes underserved youth from ages 6 - 19 years old, offering free programming focused on creativity and expression. How did you get involved with RAW and can you tell our readers a little about this invaluable and unique community-based program? I interviewed for RAW when I was living in Oregon and planning on moving back to the east coast. I knew the Program Director, Kathe Swaback because she had a studio across the street from my wife’s. I never interviewed anywhere else because there was no better place to work. Raw Art Works is an arts nonprofit in Lynn that offers free art groups for youth from Elementary into High School. Our mission is to ignite the desire to create and the confidence to succeed for our kids and teens. We do this by creating a safe place where youth can express themselves through paint, ink, clay, film, spoken word and be celebrated for who they are without being judged. RAW was started as a program for incarcerated youth. Twenty-eight years later we occupy two buildings in Central Square and serve over 560 youths annually. We run groups during the school year, summer break and now we host family art workshops on the weekends. We frame our art projects in ways that are driven by provocative questions. Last year we asked our kids to complete the sentence “The Truth is…” through artwork. 8.) What has been your most challenging and enlightening experience as an Art Therapist? The work I do with youth is challenging and enlightening every day at RAW. I am always learning in this job. The kids who come to RAW are amazing in so many ways. 9.) What do you feel has been your greatest contribution to RAW? On the flip side, what has RAW’s greatest contribution been to you as a person and as an artist? I feel like I bring a lot of creativity and compassion to the work I do with the kids. I strive to help them express something artistically that might be harder to do otherwise. As a person, I am much better because I have the honor of being a part of someone else’s journey. So I get to run a group that has kids from all different cultural backgrounds and hear their stories of what that’s like and what they have to deal with as a young person today. They inspire me to try harder and honor what is real in myself, as that is what we ask of them every day. I still have a hard time keeping up with them pop culturally, and often embarrass myself in this arena. I’m about 1 1/2 years behind on a good day. 10.) There is a long list of programs that RAW offers and I know “Good 2 Go” is one that you have taken a special interest in. Tell us specifically what “Good 2 Go” is all about! 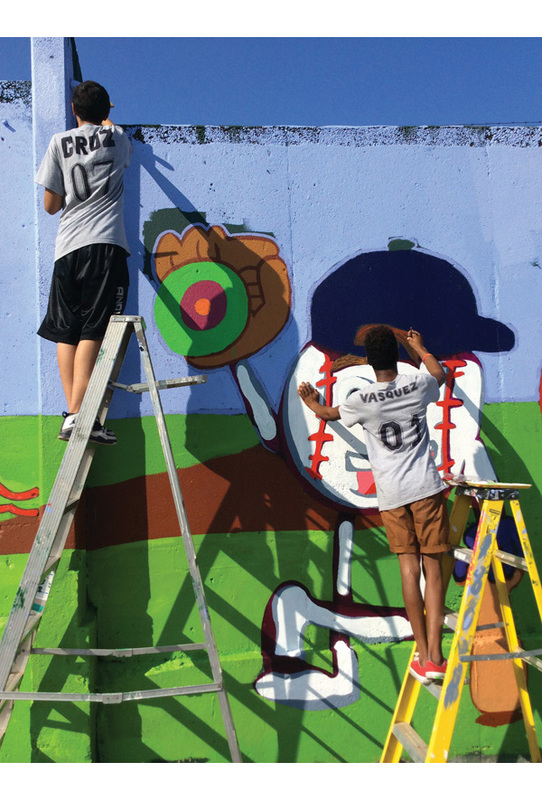 Good 2 Go is a team of nine teenage males who are employed by RAW to create public art. Most of it is in Lynn, but we have murals in Newton, Ipswich, and Methuen to name a few. The teens are responsible for meeting with the client, interviewing them, designing artwork, presenting the concepts to the client, creating the artwork and then celebrating the artwork at a dedication ceremony. They create artwork that helps beautify the city. They work closely with small businesses, nonprofits, schools and community centers. When teenagers are on site with the elderly or former gang members or the families of a deceased student or a person just passing by and they say “good job” it means something. It’s a connection. Our team is saying “we care” and they leave a permanent piece of artwork to illustrate it. 11.) Over the years, has there been an RAW/Good 2 Go project that you are most proud of? Is there something that will always stand out to remind you of how important these programs are to your community? We made a 32-foot memorial mural at KIPP Academy for a student who died of cancer. 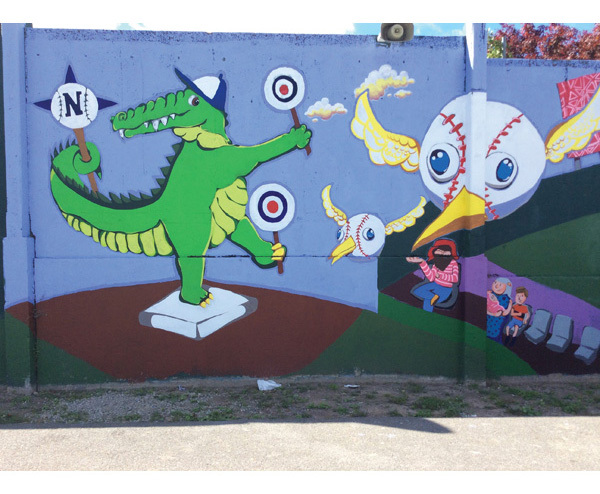 We painted a building in Clark Park for the East Lynn Little League that was tagged and broken into before we got there. Since we finished it last summer there has been no vandalism. Our projects are beautiful in different ways, whether it’s celebrating someone’s life, or bringing more attention to an area that gets forgotten, or putting a swatch of happy on the dreary, it’s hard to choose. Recently we did a painting and a sculptural piece for the Lynn Housing Authority’s Veterans’ Services. When we submitted our designs they were impressed with how much our teens truly listened to them about who they are, what they do, who they serve and ultimately what they want on the wall. 12.) What’s the best way people can contribute to RAW Art Works so you and the staff there can continue to provide FREE programs like “Good 2 Go” and many, many others? Go to our website www.rawartworks.org and click on “support raw”! 13.) Okay, last question. Can you give us an artist that needs to be on everyone's radar. Who you got that you think people should know about? Musician, photographer, poet, painter; anything goes.